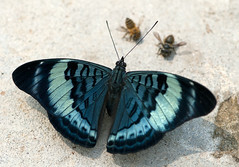 The butterfly genus Panacea contains 3 species, all confined to the neotropics. They are all characterised by having blackish uppersides with extensive iridescent blue / turquoise markings. Panacea regina is the largest member of the genus. It was discovered by the legendary explorer and naturalist Henry Walter Bates.